Mia Maestro (left) stars as Carmen Denali in "Breaking Dawn - Part 1." In “Breaking Dawn,” the fourth installment of the series, which has been split into two parts, the Denali clan is invited to the wedding of Edward and Bella (Kristen Stewart). Maestro will reprise her role in “Part 2” in November 2012. During our interview, Maestro, who has starred in such films as “Tango,” “The Motorcycle Diaries,” and the 2007 remake of “Poseidon,” talked about what it takes to become a vampire and how one of her songs ended up on the film’s soundtrack. You weren’t a fan of the series before, so did you become one after you were cast? Well, I became an actress that does her homework. (Laughs) You get so much information from the books. [Author] Stephenie Meyer is so thorough with character development, so it’s very useful to have all her text and description of the characters. What does it take to become a vampire? The costume and contact lenses are just so specific that it helps out a lot. The white makeup also helps because we’re a little pale. When you have such drastic changes in makeup and costume, becoming the character is a lot easier. Since there are three movies before this one, how do you confront your role as a new character to the series? We had to do the research – read the novels and watch the movies – but I think “Breaking Dawn” is a lot different than the other books. It’s more mature and intimate. Bill Condon is a director that is more focused on the acting and the relationships between the characters. It felt like we were doing a movie that connected to the others, but one that was more specific in a way. Being a new character is like going to a new school. You have to try to maintain your own autonomy and your own personality. Were you disappointed when you found out Carmen doesn’t have any special powers? I was so disappointed! (Laughs) But we had a running joke with some of the actors. We said Carmen has the power of dance. So, whenever the Volturi were coming to get us, Carmen would break into choreography right away. Not many people know you’re also a musician and that one of your songs is on the film’s soundtrack. That must be a nice bonus. Yeah, I have an album coming out next year and one of my songs was chosen by Bill Condon be on the soundtrack. It’s called “Llovera” (“It Will Rain”). It’s a song in Spanish. It’s the only Spanish song that has ever been in both the film and soundtrack. They actually chose a very beautiful moment in the film to play the song, which is during the honeymoon. I’ve heard about doing crazy things when you’re in love, but as a woman can you identify with Bella’s wish for Edward to make her a vampire? I think so. I think we’ve all been through moments like that where you change your life for the love of your life or someone you think is the love of your life at that specific moment in time. Sometimes, you can forget about who you are in a relationship. But you can also be inspired by the person you are with to become something you always knew you wanted to become. The admiration you have for the other person makes you want to become a higher form of yourself. I think that’s what happens in this story between Bella and Edward. I don’t think she loses herself to Edward’s world. I think she realizes who she really is when she meets him. One can only hope the person you love will make you the best version of yourself. “Tango” is still one of my favorite dance movies ever. So, do you get a chance to dance at the wedding? I get to dance a little with [actor] Christian Camargo. Every time there is a dance sequence I always want to get in. I love to dance so much. It’s one of my guilty pleasures in life and my hobby. You’ve been pretty busy this year with two other feature films. As an actress, is it more rewarding to star in a film like “Breaking Dawn” that has such a major following or does the independent work you do give you the same fulfillment? Well, I love doing independent films. I don’t want to generalize, but most of the time independent films are more focused on acting I enjoy doing better. On the other hand, “Twlight” had a huge reach. I’m just really enjoying that part of it. Then, just having a song in the film that is so precious to me gives me a creative outlet. It’s like a baby of mine in the film. I’m very fulfilled because of my music in it. I think it’s quite interesting to have both at the same time. It’s quite a combination that doesn’t happen very often. After this film, we are going to see you in “Savages” directed by Oliver Stone. What was that experience like working with someone as highly-regarded as him? It’s such a fantastic film based on this incredible book by Don Winslow. It was such a treat to be directed by Mr. Oliver Stone. I play Benicio del Toro’s wife in the film, so all my scenes are with him. That was a wonderful experience. I can’t wait to see how the film turns out. It has a fantastic ensemble cast. 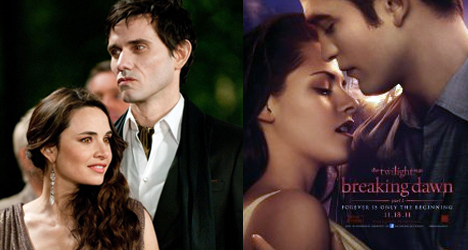 It’s been a really interesting year between “Twilight,” my music and Oliver’s film. Such different project from very different natures. Each of them are very fulfilling in their own way.